awsmsauce | Food, fashion, cars, and everything awsm. Food, fashion, cars, and everything awsm. Let me start off by saying that dining at Japaneiro is one of the best experiences I’ve had in a while. It all started off one night when some friends and I were looking for a restaurant that offered a late night happy hour. 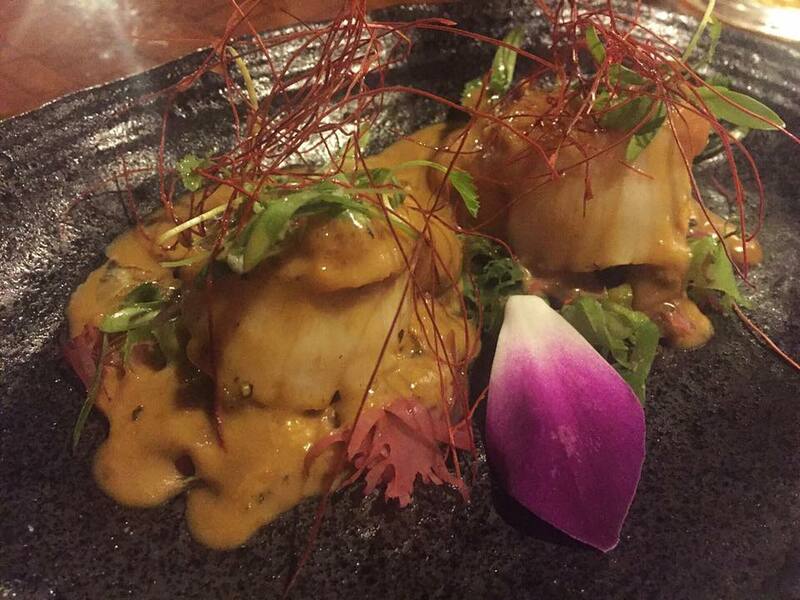 As we looked through Yelp we saw that Japaneiro had a ton of reviews and was rated 4 ½ stars. I looked through the pictures and saw that the happy hour menu looked good, and when I saw that they offered Truffle Bone Marrow on their regular menu, I was sold! When we got to the restaurant and saw their specials and the rest of the menu, we realized that this meal wouldn’t be just about the happy hour anymore… there were just way too many delicious things to try! We started off with the Kumamoto Oysters, and these were so amazingly fresh. They are probably the best kind of oysters I’ve had because they’re delicately small and very sweet. They have even been dubbed as the sweetest oysters out there. 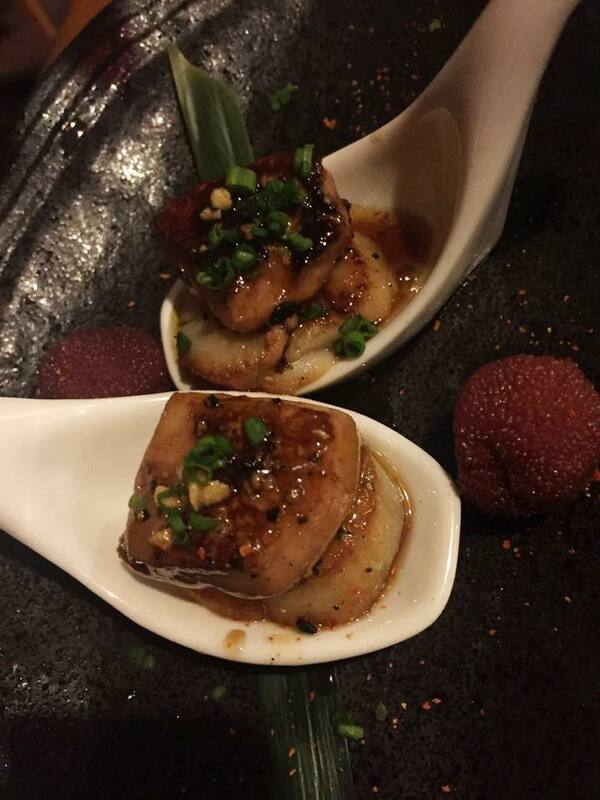 Next we had the scallop which again was very refreshing and sweet. The ponzu and jalapeno complimented it very well. Some of my favourites of the night were the Bluefin Toro with Uni and Scallop with Uni. I used to not really like uni but it was probably because I wasn’t having the good quality stuff. So I’ve definitely been missing out! Both the tuna and the scallop were just the right texture and went well with the uni. 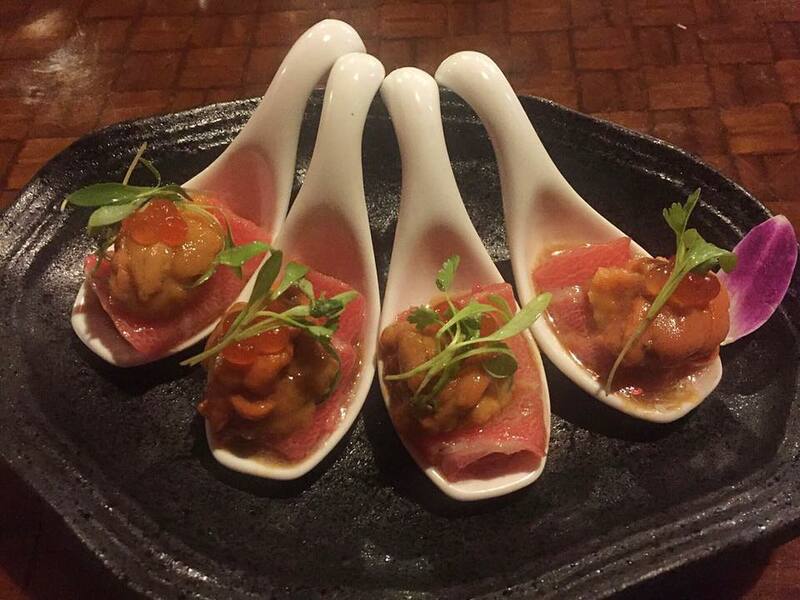 I also liked the fact that the tuna was presented on a spoon for an easy bite. 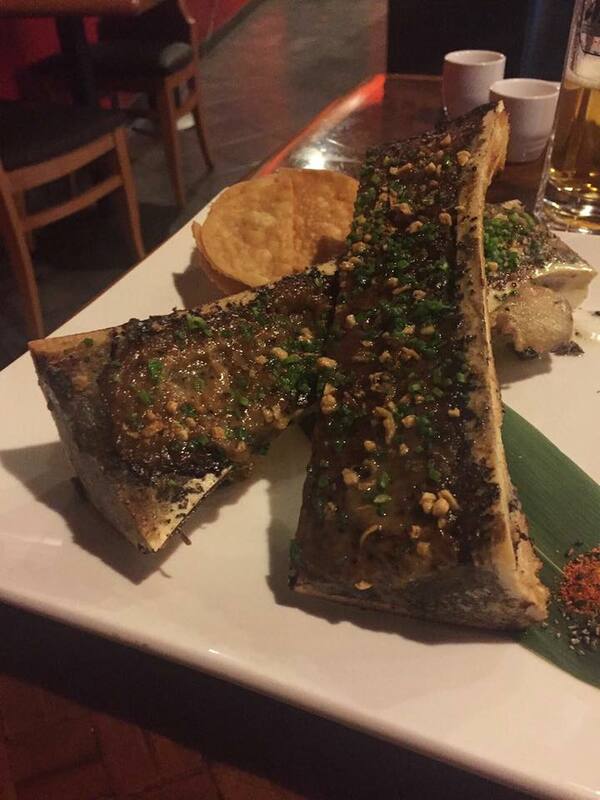 Next we have my two favourite things together… truffle and bone marrow. This was served with wonton chips and was such a rich combination that even though it was so good, I don’t think I would’ve been able to eat more than one bone… maybe. I haven’t seen truffle bone marrow offered at many restaurants, but I think more should look into adding this to their menus. 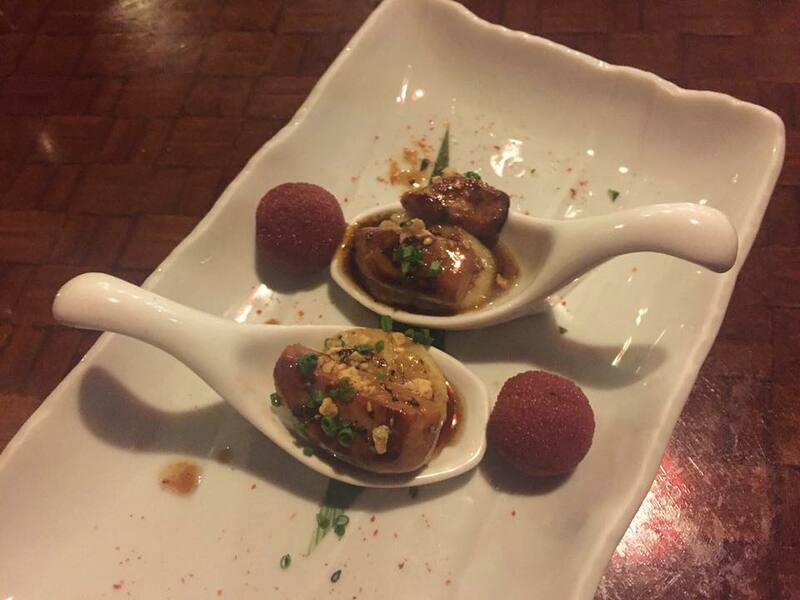 Lastly, the absolute best bite of the night was the Scallop Foie Gras. It’s actually not only the best bite of the night, but I can’t even think of something that I had that is on the same level this whole year. I’m still constantly dreaming about this dish all the time. Again, I loved the fact that it was served on a spoon. It was perfectly cooked and at just the right temperature where the warm scallop and foie gras both melted in my mouth. It was also served with yamamomo which is a type of Japanese berry, and this acted as a great palette refresher. This dish was so good that I had to get ANOTHER ONE for myself! I also had a taste of the Salmon Lotus Chips, Salmon Tacos, and Edamame with Truffle Oil from the happy hour menu, and these were great as well. I would come here for happy hour regularly because the prices are good and it’s not like you get sub-par food because it’s affordable. Towards the end of our meal the Executive Chef, Kevin Chong, came out to thank us for dining at Japaneiro, and we told him how much we loved his food and that we would most definitely be back for more. It was much appreciated for him to come out and greet us, and I’d like to thank him again. The taste, freshness, and presentation of all the dishes were divine which makes Japaneiro one of my new Vegas favourites. It’s a nice alternative if you’re over the expensive casino restaurants on the strip, and I definitely recommend that you check this place out whether you’re a local or if you’re here for vacation! Japaneiro is located at 7315 W Warm Springs Rd, Las Vegas, NV 89113, United States. The history of the Pontiac Fiero has been a short but somewhat complicated one. My first thought about this car was that the design was sleek, and that it must have been raved about in the 1980’s. Among other cars in this era I really do think that it is one of the nicer models. As I did more research, I found that there are many articles and reviews about how the Fiero is one of the worst cars ever built, a car that should be avoided by tall people, and one of the greatest automotive financial disasters of all time. On the flip side, there are also articles rating it as one of the best sports cars of the 1980’s, and one of the best choices for future collectibility. With its launch in 1984 the Pontiac Fiero was an affordable ($7,999 to be exact), mid-engine sports car that showcased new techniques in production and design. It is too bad that its unimpressive specifications and series of problems brought it down. People saw it as one of GM’s disasters because it was overweight with an underwhelming speed. It also had bad reports of reliability problems and overheating issues. GM did try to make better changes to the model over the years, and as its changes and upgrades fluctuated, so did its sales. In 1985, the Fiero got the V6 engine and there was also a new GT model. Unfortunately, the Fiero’s other deficiencies remained, with the addition of greater fuel consumption with this new engine. In 1986, things were looking up for the car with the introduction of the new GT model with a sleeker design. Concerns started growing about its reliability and safety because the overheating of the engines even led to engine fires. GM did not want to order a recall, and treated the engine fires as warranty repairs, hoping that would pay off Fiero owners to keep it on the down low. As the safety reports climbed higher, the NHTSA began an investigation, and with their findings they forced Pontiac to recall all 1984 models. GM then issued the recall notice on the evening before Thanksgiving 1987. In its final year, 1988, the Fiero had more power and new suspension, but only had 39,571 sales which was their lowest to date. There were people that were still optimistic about future models, with talk about a turbocharged 89’ model and even a convertible, but on March 1, 1988, Pontiac announced that the Fiero would be discontinued at the end of the 1988 model year. The Pontiac Fiero was just another one of those GM cars that was killed just about the time its full potential was reached. Despite its short-lived life, Fiero’s have remained popular for many years for car collectors and builders. I had the chance to drive a 1988 Pontiac Fiero GT . It had a new yellow paint job, and although I thought it looked nice and sporty, I understood the shortcomings of its performance. The car did feel very heavy, and it’s steering was ridiculously stiff. It was far from a smooth ride considering how jumpy the gear changes were, and its disc brakes were unbalanced. It also wasn’t very fast because of how heavy it was. I am still learning a lot about cars, and gathering real experiences of driving different models, but I could feel the flaws of this car. Overall, even though it’s not such a great drive I can see how people like the Fiero and consider it as a collectible. The stock form of the Fiero GT is appealing, and some collectors have made it even better with upgrades in custom bodywork. I still think that is a great collectible for 80’s car enthusiasts that want to take this car for the occasional drive around the block. Hibiscus’ 42 Ingredient Salad: Best. Salad. Ever. Don’t get me wrong, I am not a vegan… but I do love vegan food! The interesting comparisons of vegan fare to real meat and dairy, and the fresh tastes of vegan ingredients keeps me wanting to try everything it has to offer. Hibiscus Café is gluten free, vegan, vegetarian, and organic restaurant that many have told me I had to try. 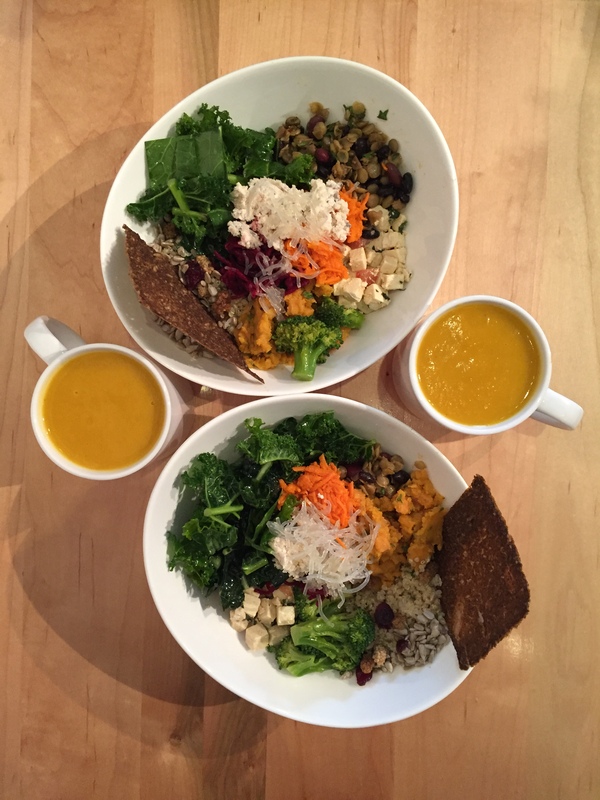 They serve everything from buckwheat crepes to soups and salads. They also have their own homemade dairy-free ice cream served in a gluten-free cone, and other desserts such as cookies and brownies. 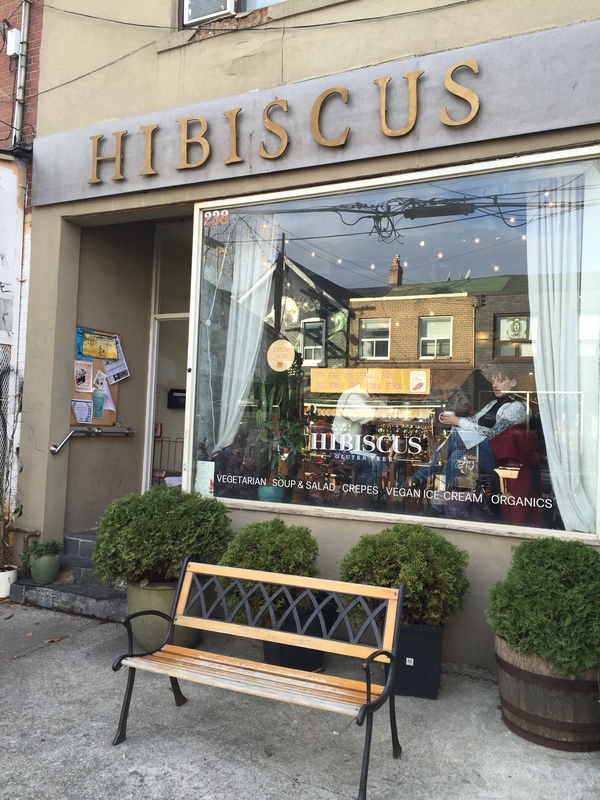 Hibiscus is located in the Kensington Market in downtown Toronto, which is one of my favourite places to grab food. The area has a casual and relaxed feel throughout its streets and sidewalks, and that is also what Hibiscus embodies. It has a nice pleasant atmosphere and I felt comfortable dining there. The service was also very friendly and not at all stuck-up, as many might feel may come from a vegan, and what some might call, “hipster” place. My lunch date and I got quickly seated when we arrived at lunch time on a Sunday. We might’ve been a little lucky because 10 minutes after we sat, there was a lineup of about 3 different parties at the door. After we both looked at the menu we realized that we both wanted to try the same thing. So we ordered the Soup & Salad, and I got an Iced Matcha drink along with it. Their soups are changed up from time to time and that day it was a ginger squash soup. When it arrived at the table I could already smell the ginger and it was fragrant and tantalizing. I loved the flavours, but the ginger is pretty strong, so if you don’t like ginger you wouldn’t enjoy this soup. They managed to make the soup feel creamy with a smooth texture. I also enjoyed that it was served in a mug for easy sipping! As for the salad, it might just be my favourite salad of all time, and that’s huge! The salad is a combination of 42 ingredients which gives it many dimensions of fresh flavour along with different textures. It has even been mentioned by Taste Toronto as one of the best salads in their Top 10 Salads in Toronto list. 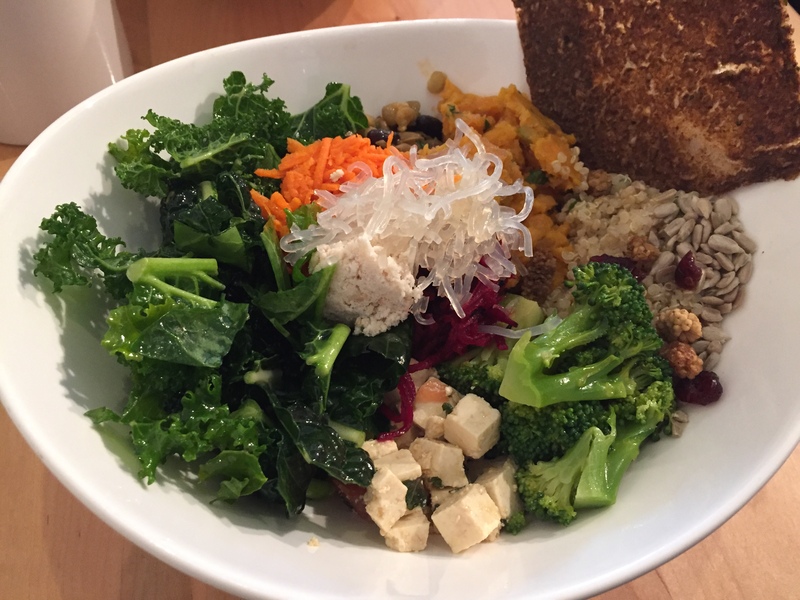 It has all the ingredients that I love in a salad including quinoa, sweet potato, broccoli, beans, tofu, kale, carrot, beet, kelp, okara, and a raw cracker (Now I’m wondering if they have the all the ingredients available if you ask for them). Everything went well with each other, and every bite was something different. If I lived closer to Hibiscus I would probably be eating this more than once a week… or more than twice a week. Best. Salad. Ever. Lastly, I didn’t expect much from the Iced Matcha, but I recommend that you just skip this drink as it was bland and only had a tiny hint of matcha in it. Not feeling full from vegan meals is sometimes a concern for me, but after this one I definitely felt fully satisfied. I would be eating here all the time if I could! Hibiscus is located at 238 Augusta Ave, Toronto, ON M5T 2L7.